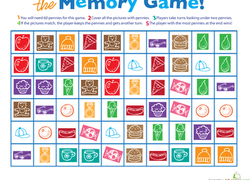 Boost those memorization skills with our entertaining collection of printable memory games! From sight words, shapes, and weather to rainforest animals and state capitals, these memory games and worksheets utilize colorful images and fun activities to boost essential memory skills while keeping kids entertained and engaged. Play at home, take them in the car, or just keep them on hand to fill a quiet moment. 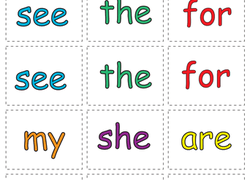 Help your child strengthen his memorization skills with this printable worksheet, which uses sight words in a simple matching game. This Valentine's Day challenge your preschooler's memory with this free printable game! Help your child to strengthen his memory with this matching game that uses sight words to help with your child's memory and reading skills. This game will let your child practice naming her shapes and building her memorization skills at the same time! In this printable memory game, kids take turns looking under pennies in order to find matching pairs of pictures. Print out this worksheet to give your child a fun food memory game for her to play anytime she wants! Take a look at different forms of transportation with your child, and build on her reading skills. 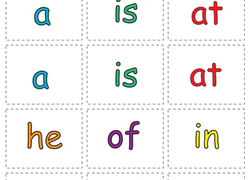 This valentine game tasks the players to match Valentine's Day-themed pictures and words. Play this valentine game to strengthen memory skills and celebrate. This Christmas spot the difference worksheet is a festive way to build concentration and memory skills. Try our Christmas spot the difference exercise. Does your child love dinosaurs? Try this fun memory match game, a great way for him to learn the real names of his favorite dinos. 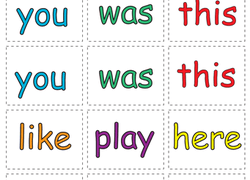 Cut out these cards for a simple matching game that uses sight words to help with your child's memory and reading skills. This memory game for kids features basic facial features, so they can learn their parts of the body as they play along. How many musical matches can you make from memory? Give your child a fun challenge with a matching game! Meet all the U.S. presidents in this tricky card game that not only quizzes kids on presidential trivia, but helps them practice learning strategies, too. Does your child know what all the street signs mean? Give him a fun game where he can learn different street signs and practice memorization! 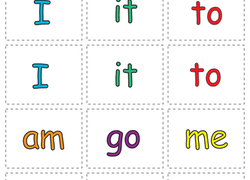 Give your child help strengthening his memorization skills with this printable worksheet, which uses sight words in a simple matching game. This simple animal memory game will help preschoolers associate different sounds with the animals who make them. Play "go fish" with a twist! Your child will have to "fish" for matching colors with this memory match game, trying to memorize the face-down cards. Can your child name all the animals who live on a farm? Here are two great coloring worksheets that also double as a memory matching game! Play a numbers memory game with your little learner. She'll need to use logic and counting skills to play this game. Did you know there is a rainforest animal called a squirrel monkey? Learn a few fascinating new creatures with this rainforest animals sheet. Help your child learn the weather and practice his memory skills with a simple but fun memory match game! Pack this anima memory game on your next road trip, and keep your child occupied between rest stops. How sharp is your child's memory? Give her a fun way to practice memorization with a match-up card game! 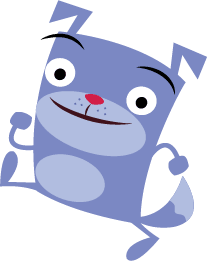 KidsMemory.com is now a part of Education.com. We have handpicked a page similar to what you were looking for!